A simple ring of a phone call, text message or Snapchat has the power to make a person stop in their tracks to respond, look down from their steering wheel and grow anxious not knowing who is trying to contact them. As a matter of fact, 95% of texts are read within three minutes of being sent. There’s a correlation between smartphone usage and lower satisfaction with life, according to Jacob Barkley, professor of health sciences at Kent State University. In 2018, the Centers for Disease Control issued some sobering statistics about student anxiety and depression. Teens are more lonely, anxious and depressed than ever. About a third of teens surveyed by the CDC said they’d felt persistent sadness or hopelessness. 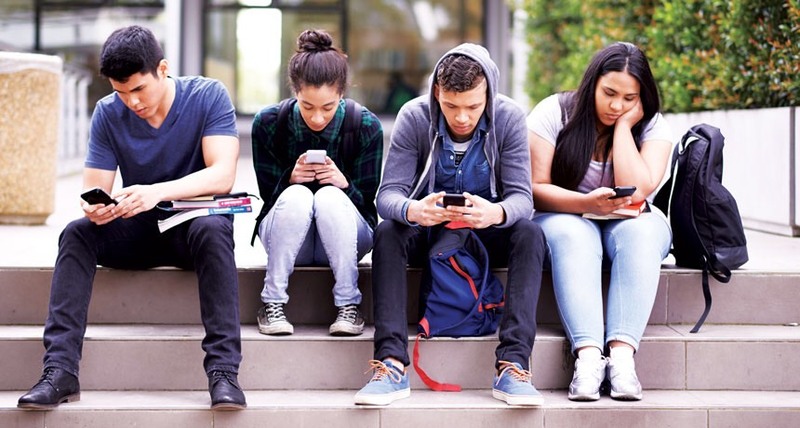 Teenagers are commonly on their phones, even while being around friends. I came across a man who gave up social media for a month to see the effects on his daily life. I felt inspired by this video, so I decided to give it a go. Before I could change my mind, I deleted Instagram from my phone. The first few hours were difficult for me. I realized the excessive number of times I would unlock my phone, hover my thumb over where the Instagram icon used to be, then remember that there was nothing there. I would check five minutes later again and ten minutes after that. After two weeks of being in the dark and not knowing what my peers were posting, I started to miss Instagram. I had a burning desire to just scroll through, even if it was only for a few minutes, to see some of the most recent posts. I remembered all of the fun photos I wished I could post, craving the instant gratification of the red hearts that appear in the activity section of Instagram. I can truly say that my life has been better without the influence of social media. I no longer gravitate to my phone when I have friends over, and lunchtime is much less boring when I interact with my peers face-to-face. I strongly encourage you to do the same as I have. I promise you that, although it’s challenging at first, and sometimes you have major FOMO, it’s worth it. I began to realize how silly the trend of social media really is. Many of my friends tend to take breaks from our conversation to quickly check their Instagram feed, and it can surely make somebody feel like they are less important than what’s on the screen. Even if you can’t bring yourself to delete the app entirely, you could try to scroll through less per day. Based on my experience, being disconnected is great. Hi, my name is Blossom and I am a self taught freelance photographer. I became interested in digital photography in my junior year of high school. I draws inspiration from Josef Adamu, Petra Collins, Adrienne Raquel, Micaiah Carter, Travis Matthews, Florence Ngala, and Ronan Mckenzie. Her love for it stemmed from her visually receptive nature and continues to blossom as she experiences life.